Transcribed by Bob Davis - June, 2004 Paris, May 18. 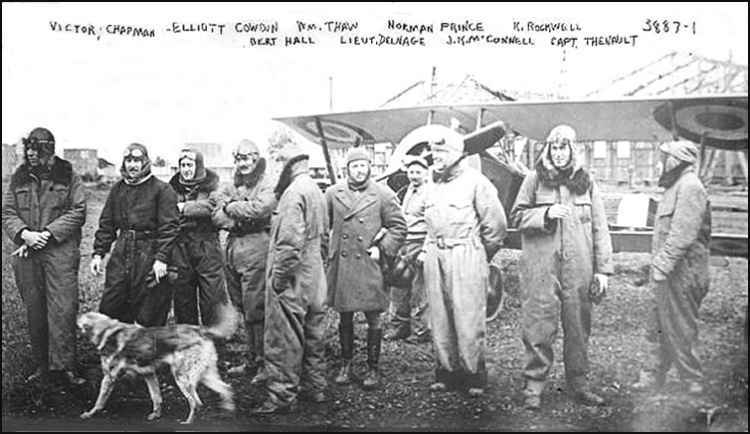 - The American aviators forming the Franco-American flying corps took part in an expedition over the German lines the first time as a separate unit. They sustained particularly heavy shelling as they recrossed the front, but landed safely. The flotilla, including the craft piloted by Corporal Kiffen Rockwell, of Atlanta; Corporal James R. McConnell, of Carthage, N. C.; Sergeant Elliott Cowdin, of New York; Lieutenant William K. Thaw, of Pittsburg; Sergeant Norman Prince, of Boston; and Sergeant Hall, of Galveston, started at daybreak and spent nearly two hours reconnoitering under a hot fire but encountered no German machines. Corporal McConnell was flying at a height of 12,000 feet but German shells burst all around him, showing that the range of the German anti-aircraft guns had lengthened. Corporal Victor Chapman's machine was hit and driven out of its course, returning so late to its base as to cause anxiety regarding Chapman's fate. 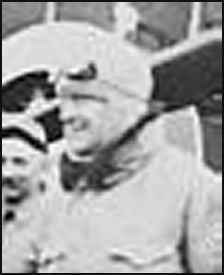 The aeroplane piloted by Lieutenant Thaw lost part of its tail piece and the propeller was damaged by a shell. Three more Franco-American flotillas are to be organized from the forty additional American volunteers now in training. ONLINE RESOURCES If you search for "James Rogers McConnell," using the Google search engine, (1-2-05), you will find about 358 links! The one cited below is perhaps the most comprehensive of all and is the logical place to start. Memorial Collections This exhibit, which is found on the University of Virginia Library website, offers an introduction to the collection which is summarized in the following extract from the homepage. "The James Rogers McConnell papers consist of approximately 210 items, including 160 letters written by McConnell to his friend Paul Ayres Rockwell and to Mademoiselle Marcelle Guérin, a French nurse serving at the hospital in Paris. The letters date from 1915, when McConnell served with the American Ambulance service on the Western Front in France; 1916, the year of the formation of the Lafayette Escadrille, with McConnell as one of its seven original American pilots; and, 1917, ending a few days before McConnell's death. The letters provide a vivid picture of McConnell's service in the cause of France, not only as a non-combatant, but also as an active participant in the war. " You can access his story by clicking on the title above. "McConnell was killed in aerial combat with two German planes, above the Somme battlefields, near the village of Flavy-le-Martel, Aisne, on March 19, 1917. He thereby became the last American pilot of the squadron to die under French colors, before American entrance into the war in April 1917. Pictured here is the memorial at the site where he fell."